Before last weekend I was considering writing full reviews of the first two beers in this review; then last weekend hit and we were in full Untappd Catchup mode! Here's a 9 badge post with a wide variety of styles, take a look below and as usual let me know your thoughts. Brewnettes Have More Fun (Level 3) has been coming for a while. The cans of Moose Drool from Big Sky Brewery in the U.S. is a different beast to the drab offering I once had in the bottle. It's very malty and creamy with enough hops to keep it balanced. If you're looking for an easy brown ale, this is one to look out for (in a can only!). Riders Brew Co's Loose Trucks was the beer that earned me the Heavyweight (Level 28) badge. It's a relatively new brewery, from the guy who hosts Ale Stars at the Local Taphouse. This is one of their core beers and is a straight up and down Porter. There's plenty of chocolate with nice roastiness to accompany it. It's a Porter that I could drink all day long, it's very easy drinking with great flavour. Hopped Up is fast becoming the most popular badge I'm receiving, this is level 7 already. The beer was Bacchus' Nelson IPA. It''s hopped with Nelson Sauvin hops and is very passionfruit-y. You can read more about this beer, and some other New Zealand hopped Single Hop IPA's from Bacchus in Part 1 of my expose on them here. I highly recommend the Bacchus range if you're a looking to learn a bit more about different hops. It's been far too long since I had a beer from NZ brewers Epic. Lupulingus is one of their latest offerings and is packed full of hops. Drink Like a Kiwi (Level 17) was the badge and it's a beer that I could drink over and over again! It's very resinous, which will obviously put some off, but for 9% it's dangerously drinkable! The news that Stone Brewing Co.'s beer were going to be cold shipped to Australia was met with much excitement earlier this year. Their Cali-Belgique, a Belgian IPA, I've heard it's a sensational example of the style and the one I was most excited for. It certainly didn't let me down, with lovely citrus bitterness up front before the Belgian funk kicks in; it's awesome! The badge? Hopped Up (Level 8), I told you these were coming thick and fast! Considering how much Irish beer (read Guinness!) I've been known to consume, I was surprised just how long the Luck of the Irish badge took to come round. That's probably been because of the lack of Irish craft beer available in Australia. 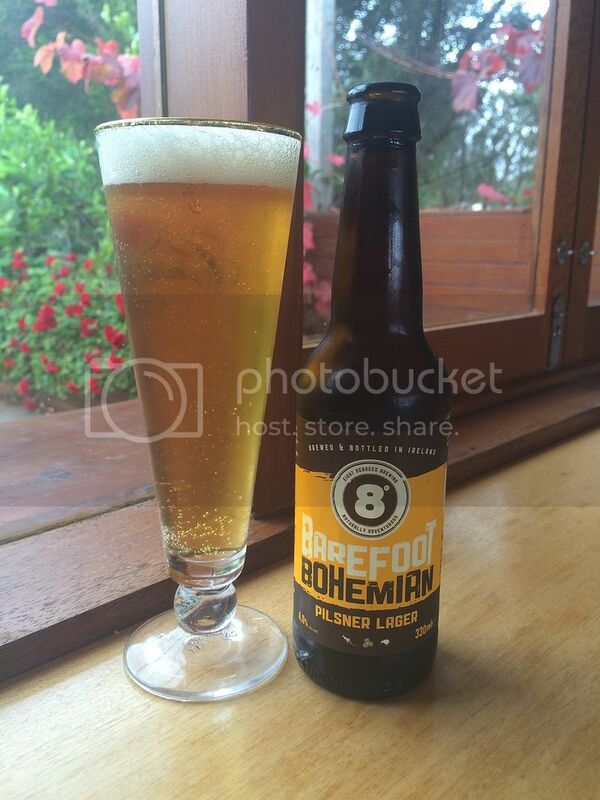 Eight Degrees (8°) Brewing are the first I know of to be imported and their Barefoot Bohemian Pilsner earned this honour. It was a very impressive pils, with a lovely crisp body and nice spicy and grassy hops - which I do believe are true Saaz. I'm looking forward to trying more of their range over the next couple of months. Heavyweight (Level 29) was next up and it was a beer I was very hyped up for; Cherry Bomb from Garage Project. It's a very chocolatey Imperial Porter that clocks in at 9%, which has had sour cherries added. At first I loved it, with the dark chocolate and sour cherries combining really well; however as the beer warmed I thought it became a little cloying.., It was still good but is definitely a beer to share, considering it comes in a bomber. It was a little underwhelming for me. Modern Times is a brewery that I regularly see images of in various (US dominated) Facebook groups. Blazing World is their flagship beer, a hoppy amber ale which is bit different... I had this with dinner on Anzac Day and all I wanted after finishing it was more! The hops were very fruity and the malts slightly sticky and sweet! It was brilliant and something I'm going to buy heaps of! Land of the Free (Level 340 was the badge. So there we have it - 9 beers very briefly reviewed. As usual let me know your thoughts if you've had any of these - a number of them really impressed me. Hopefully I'll get a bit more content up later this week, I have a few things that are half done but you'll all have to wait and see. In the meantime; questions, suggestions etc. can be directed to gus.norris7@gmail.com or @Beeroclockau on Twitter.